@WebMaster, please do something about the spammer. Well, whether he's spamming or not, I wouldn't mind if he stopped posting here altogether. Well, whether he's spamming or not, I'd rather him stop posting here altogether. do you understand any English at all? China’s DF-21D “carrier killer” ballistic missile grabbed headlines since entering service in 2010 for its ability to destroy large U.S. warships up to 1,450 kilometers from the country’s coasts. The missile was key to altering the balance of power in the South and East China Seas in Beijing’s favor and vastly expanding the country’s maritime anti-access/area denial (A2/AD) zone in the face of a growing American naval presence. The United States Navy, by the admission of the U.S. Naval Institute, had no defense against such attacks, and the missile thus limits the United States’ ability to respond to a potential crisis in the Taiwan Strait as it did in 1996. While the DF-21D is a unique and highly formidable weapons system, a new weapons system deployed from 2018 is likely to pose a far greater threat to U.S. warships in the Pacific — the Russian military’s new Kh-47M2 Kinzhal hypersonic missile. The Kinzhal (Dagger) was unveiled by Russian President Vladimir Putin personally in March 2018 as one of six new hypersonic weapons that would imminently enter service in the Russian armed forces. While other hypersonic platforms such as the the Sarmat and Avangard ICBMS (intercontinental ballistic missiles) were designed solely to fulfill a strategic nuclear delivery role, what makes the Kinzhal stand out is its ability to be used as a tactical strike platform with a non-nuclear warhead — meaning it has battlefield uses for precision strikes against military targets. Though the Kinzhal can deploy a nuclear warhead for a strategic strike role, what makes it truly invaluable is its ability to fulfill a tactical ship hunting role at extreme ranges — arguably better than any other long range missile platform currently in service elsewhere. The Kinzhal’s warhead is estimated at between 500 and 700 kilograms, a formidable payload though still well below that of China’s DF-21D. What sets the Kinzhal apart, however, and makes it a truly lethal ship hunter, is its combination of precision, range, and hypersonic speed of impact of over Mach 5. Even with no warhead, the kinetic energy of this impact alone is enough to disable if not completely destroy even the largest of warships. Some indication of its power can be gained by examining the Russian-Indian BrahMos anti-ship cruise missile, a platform restricted to speeds of Mach 2.8 and carrying a 250 kg warhead, which was developed to tear large warships ships in half with the sheer force of its high speed impact — and despite lacking hypersonic speeds it was proven able to do so. From this it can be inferred that the Kinzhal, a longer ranged and much faster platform with approximately double the Brahmos’ kinetic energy and more than double the payload, is highly likely to be able to destroy even the largest of enemy warships with a single strike — and does so at distances of up to 2,000 km. A number of key figures in the United States military have noted following Russia’s unveiling of its new hypersonic missiles that the United States currently has no capabilities with which to intercept attacks at such high speeds, with Strategic Command General John Hyten stating during a meeting of the Senate Armed Services Committee that U.S. air defense systems remain wholly incapable of stopping attacks by hypersonic platforms. Indeed, according to a number of reports by U.S. sources, some of the military’s most advanced air defense platforms have recently struggled to intercept even basic attacks from subsonic missiles such as the Scud B, a primitive design which dates back over 50 years. This has serious implications not only for the U.S. mainland in the face of Russia’s new ICBMs, but also for the U.S. Navy which could well see its destroyers and carriers sunk by the new Kinzhal strike platforms at extreme ranges in the event of conflict. While Russia has little need for long-range anti-ship missiles on its western borders, where maritime distances are relatively confined, deployment of the Kinzhal to the country’s Far East would have significant implications for the balance of power in the Pacific. 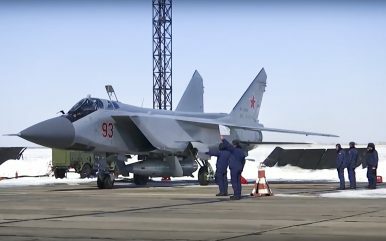 With the MiG-31 interceptor retaining a combat radius of 1,500 km, the Russian Air Force would be able to target U.S. warships up to 3,500 km away from its coasts. Should combat aircraft deploy from near Vladivostok in Russia’s Far East their strike range would cover the entire East China Sea and much of the South China Sea, as far as the Philippines and including the entire contested maritime region claimed by China and subject to U.S. freedom of navigation patrols. The implications are severe indeed, and could well seriously strengthen Moscow’s position in the Pacific. Should Russia seek to deny the naval assets of United States and its allies access to the South and East China Seas, either to aid Beijing or for its own reasons, it would have a weapon at its disposal more capable of doing so than any currently in Chinese hands. Moscow could leverage this asset to gain considerable influence in the Pacific, which can more than compensate for the relative scarcity of its military assets in the region. The Kinzhal may yet usurp the title of the Pacific’s prime “carrier killer” and could well facilitate the longstanding Russian and Chinese goal of reducing the Western bloc’s influence and military presence in the Pacific by leaving the U.S. surface fleet effectively defenseless — undermining the unchallenged U.S. naval dominance which has been the bedrock of the regional order since 1945. Moscow is highly likely to leverage this formidable asset to its advantage in future. Abraham Ait is a military analyst specializing in Asia-Pacific security and the role of air power in modern warfare. He is chief editor of Military Watch Magazine. bruceb1959, Dizasta1 and Equation like this. What is the overall operationnability of the Russian navy ? Depends on the type of ships you are talking about. Their nuclear submarines are probably the best performing asset. For example the nuclear subs. I would say like 30% of them are newly built, 50% have been refurbished, and the rest are either being scrapped or in the process of being refurbished. Several new subs are being built as well. They have also built a lot of corvettes and lightweight frigates (<3000 tons). Their worst performing assets are the large frigates, destroyers, and cruisers. I would say like 30% of those have had minor refurbishing done and only a couple of new medium size multipurpose vessels and been built. The vast majority of their large surface vessels are in storage and will likely be scrapped because of the extreme difficulty and expense to repurpose them from single-purpose vessels to more novel multi-purpose ones. It is extremely difficult to convert those ships to the new UKSK VLS cells. While the Admiral Gorshkov class frigate design is now (finally) operational and the second frigate of the class is in trials no new frigates have been built yet with Russian rather than Ukrainian marine gas turbine engines. Their new nuclear battlecruiser design is also still in the design process. Nevermind the LHDs or carriers. Although their lightweight carrier design seems doable. So I would say the Russians retain the capability to deny operations in their own seas but have extremely limited blue-water surface naval capabilities and issues with long distance power projection. So things are less bad than they were in the early 2000s when most of their navy was basically rusting or sitting in port, but nowhere near their capabilities in the 1980s. Due to their newer small frigates with UKSK VLS cells being much more capable than older craft and their still impressive submarine fleet they can easily defend their own waters. If you compare their small frigates with similar displacement NATO vessels they are way more densely armed. I suspect this results in worse seamanship and poorer crew comfort so it should render those ships less capable of long duration missions. But that is not particularly important given their current emphasis on defense rather than power projection. The fact that China now has a large blue-water fleet to oppose the US and its allies might have made Russia reduce the priority of building larger vessels as well. All in all the events on Ukraine and the sanctions had a major impact on large gas turbine and diesel powered vessels construction. I expect that to be solved over the next years but we still haven't seen any visible progress in the area in terms of actual ships in service. For example the Russian SSBNs. They have 3x new Project 955 (Borei) submarines operational, 1x Project 955A launched, 4x Project 955A under construction. Each submarine can carry 16x SLBMs. They also have 1x Typhoon class active (overhauled), 2x Typhoon class in storage. 6x Delta IV class active (overhauled over the last decade). This is more than enough to keep their second strike deterrent. As an example the UK or France only have 4x SSBNs each. In terms of SSGNs the Russians have 1x new Project 885 (Yasen) operational, 1x Project 885M launched and in trials, 5x Project 885M under construction. 5x Oscar class submarines refurbished over the last decade. Plus 2x Oscar class submarines in the process of major overhaul to Project 949AM standard which will replace the Granit missiles with more modern universal launchers which will be able to launch either the Oniks, Kalibr, or even the Zircon in the future as well as a modernized electronics suite. 1x Oscar is being converted for spec ops. With regards to attack submarines they have refurbished 4x Typhoon class, with 6x Typhoons under overhaul, 2x Typhoon in storage. However the attack submarines duties are currently being turned over to the modern multipurpose SSGNs like the Yasen. So the Russians are in the verge of putting two new submarine classes which are based into established recent technology into service. Project 955M and Project 885M. They are also designing a new submarine class, the Husky, to replace the Oscar class and maybe the Yasen from what I understand. So their nuclear submarines are in a decent state of operational capability and should be mostly replaced with all new types over the next 5 years.